The message to “Innovate or Die” is coming through strong and clear. Digital developments and competitive pressures drive many companies to look at ways to reinvent themselves and their products. But key corporate trademarks, such as economies of scale, efficiency and homogeneity, do not lend themselves easily to agile mindsets and creative solutions to respond to fast market changes. This innovation vacuum is quickly being filled by waves of start-ups, vying to be the next big disruptive player on the market. One avenue for existing companies is therefore to turn to start-ups as a source of innovation and to use their financial power to assimilate the start-ups and their products in a bet to “buy innovation”. But this approach doesn’t always work. It can indeed have some significant drawbacks that become evident when the expected innovation gains do not materialise. 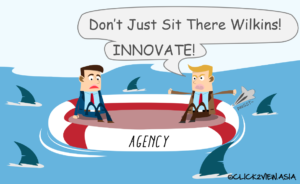 And, in some cases, this approach can actually kill off the corporate innovation drive altogether. However, there is another way. Companies have an intrinsic source of innovation that they, when given the right circumstances and incentives, can tap into: their employees. 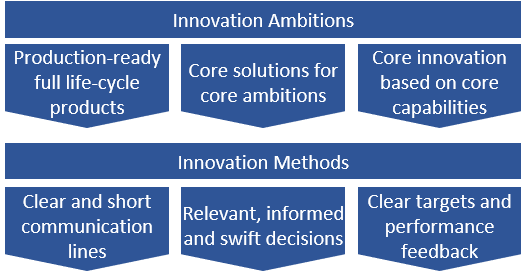 The proposed “InnoVenture” approach takes the benefits of the start-up approach and re-purposes these in a corporate context to create “innervation” – home-grown, internal innovation. Start-ups show no sign of slowing down. Unencumbered by old business models and high overheads, they drive innovation forward through flexible and focused creative practices. Many “old businesses” attempt to incorporate some of the start-up magic into their operations through sponsorship, acquisitions or by creating incubators that mimic the start-up culture. Start-ups are meant to bring some key advantages: they are more efficient, faster and more flexible and, most importantly, more innovative than regular businesses. 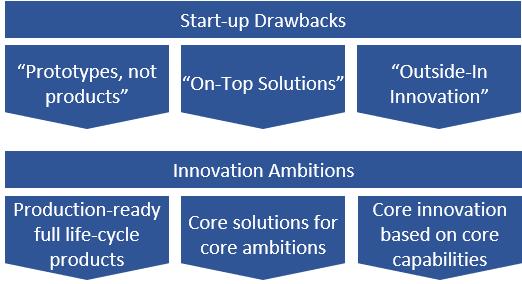 This is probably all true in a stand-alone context, but to focus the corporate innovation strategy on start-ups might not only be missing the point, but it might be counterproductive and even damage the company’s innovation drive. Let’s look at some of these start-up advantages in more detail and see how they fare in the corporate world. Start-ups are supposed to be more efficient than regular organisations, which appears, at least on the surface, to be true. This efficiency is mainly due to less overheads, higher productivity, stronger focus and sheer focus and determination. This willingness and passion to deliver indeed puts many regular organisations to shame. But is it more efficient in the long run? For one, the rate of start-up failures is high, which can impact long-term efficiency and effectiveness when your innovation strategy is based upon buying start-ups. For another, start-ups, by necessity, focus on marketable product functions and features i.e. “prototypes, not products”. Less visible aspects, such as production methods, maintainability and product quality control, attract far less attention. Yet these aspects are typically expensive and time consuming for a company to develop and so add significantly to the cost base. Lastly, regular corporations do not provide the buy-in and ownership that a start-up does. When these start-ups are transplanted into a corporate world, overall motivation and passion are affected and adversely impact productivity and efficiency. Start-ups, almost by definition, develop solutions that are “out of the box”. This is where their innovation shines. However, this external nature also can mean that many solutions are either outside the main corporate operation areas or deal with a limited part of the operational chain. And, as start-ups develop fairly generic marketable solutions, this means that these solutions still need to be adapted and operationalised to fit the company’s process environment. These “On Top Solutions” therefore typically can have a limited impact on the company’s operations or finances. That doesn’t mean they can’t be successful, but they often won’t address fundamental flaws in the existing operation, cover cross-value-chain issues or indeed leverage existing core strengths and capabilities. In addition, they can use up the change-budget and -bandwidth and in effect kill off other, perhaps more fundamental, initiatives. The external nature of start-ups creates “Outside-In Innovation”. This, on the one hand, is very beneficial as it provides the external perspective that can lead to innovative solutions, or the innovative re-purposing of existing solutions in other industries, such as Solar Impulse’ use of sailing technology to build their wings. But on the other hand, they risk presenting solutions to problems that don’t really exist in the organisation, or to those that cannot be tackled in isolation. The perfect innovative maintenance application will not resolve a failing production quality management process, but it might just hide it. This “Outside-In Innovation” issue can be compounded when internal experts, with knowledge of the company, its processes, products and customers, are not involved. This can have a seriously detrimental effect on the solution performance and suitability. Integrating the purchased start-ups and their innovation into the company has its own cultural, people and product integration challenges. These challenges can adversely affect start-up performance. This is one aspect that start-ups do really well. They have short communication lines, clear and short decision processes and clear incentives that make decisions easier to make. They also do not have any legacy technology or organisation to weigh them down. But this flexibility does come at a price: tight timescales, lack of planning, lack of certainty and lack of standardisation are all examples of flip-sides of this flexibility coin, potentially leading to operational, financial and quality issues. Conclusion: Start-ups are good at what they do, but perhaps not in a corporate context? Start-ups bring some serious advantages to innovation. They are efficient, flexible, bring outside perspective, are technology independent and are result-driven. But the use of the start-up purchase as a short-cut to corporate innovation has some serious drawbacks. The costs of integrating the solutions and achieving production-ready solutions are high, the solutions often do not solve core issues and the use of externally-bought innovation can stifle internal innovation. But there are ways to harness the benefits of the start-up whilst overcoming these drawbacks. As with any innovation, we need to start by looking at the key objectives of the customer, in this case the company, and see if there are new and better ways to reach these goals. First, we have to turn these drawbacks into positive ambitions, so that we can evaluate these and see how we can achieve these in a corporate context. “Prototypes not Products” (focus on features and functionality) changes to the ambition to create innovative, production-ready, full life-cycle products and services, that delight and innovate every step of the way. “On Top Solutions” (solutions to non-core or non-existing problems) changes to the drive to create innovative solutions that harness the strengths and capabilities and empower and accelerate the company strategy. Lastly, “Outside-in Innovation” (externally driven innovation) turns into the drive to use the power, energy and creativity of all employees and create an environment that thrives on and demands improvement and innovation across the organisation. Together with these ambitions, we have the 3 characteristics of start-up working methods that we want to preserve and continue. The short communication lines, the swift decision processes and the clear targets and performance feedback are all elements of the start-up culture that we need to take forward. To kick-start an internal innovation culture in the company, you need to activate, leverage and steer the innate ability and willingness of the people in the company to innovate and change. This is nothing new as companies have often mobilised resources for challenging undertakings. But achieving structural innovation is something less than simple for many companies. The good news is that many people in organisations are not only willing, but actually very happy, when given the opportunity, to develop and deliver innovative products, services and processes. 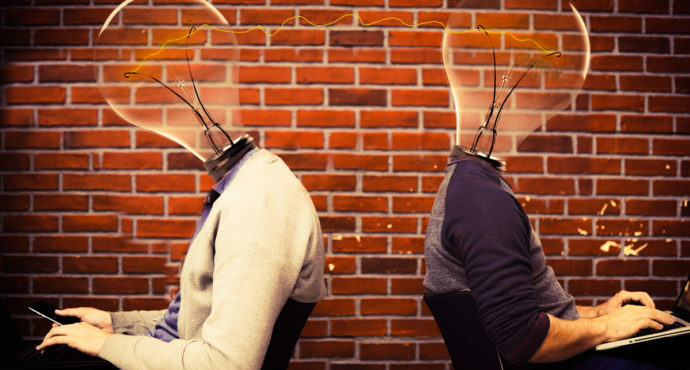 And this is doubly good news, as experienced employees bring a wealth of internal knowledge to the innovation process, thereby improving the quality and the speed of the delivery. 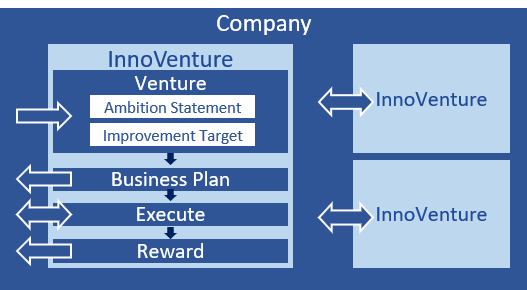 The InnoVenture approach creates a virtual start-up within the company and combines the advantages of the start-up approach with the strengths and abilities of the corporate company. It achieves the innovation ambitions and maintains the working methods by creating a sustained, active and broadly supported innovation platform and culture. Creating an InnoVenture is a 4-step process. 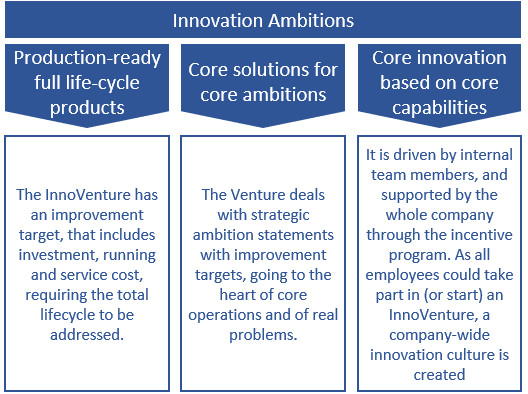 The ambition statement and the improvement target together constitute the Venture. The Venture has no solution, organisational or technology boundaries. Ventures can be defined by management, put forward by employees or be the result of analysis programmes in the business. The appropriate initial team members to deal with the Venture are selected across the organisation, supplemented if required by internal or external change, innovation and technology experts. Together they form the “InnoVenture”, a virtual start-up inside the company. The InnoVenture creates a business plan over an appropriate period (1,3,5,10 years) with one or more potential solution paths, cost and income estimates and performance targets. This business plan is then “sold” back to the management team for investment approval. The InnoVenture has no budget constraints, only ROI targets that meet the company’s investment and return guidelines. This business plan and the achievement of the performance targets are linked to incentives in the form of bonuses, virtual shares etc. These incentives are paid out upon achieving those targets during the lifetime of the Venture. This incentive plan has 2 objectives. The first is to create a close identification of the InnoVenture team members with the goals of the Venture. The second is to foster a company-wide innovation culture and to ensure the buy-in and support of all employees. Therefore, it is very important that these incentives apply to all corporate employees. This avoids an “us and them” culture, which would be counter-productive. In addition, rewarding the whole company for achieving real innovation results creates a passion and motivation to innovate. Once approved, the InnoVenture has full autonomy to execute the plan, enlist other resources (internal as well as external) and deliver the Venture. The InnoVenture develops innovative solution approaches across the organisational and technology boundaries. As all company employees are incentivised through the InnoVenture performance programme, there should be a willingness to assist delivery as much as possible. This is where innovation techniques, such as brainstorming, pre-mortem analysis, obstacle-free thinking etcetera are employed to come up with the best solution. The InnoVenture will, hopefully, deliver according to the business plan and performance targets. Compliance with corporate architectural and operational guidelines is desirable, but not mandatory. However, the InnoVenture reward is based on the total operating costs of the solution. Any additional costs, such as those incurred through non-corporate processes or technologies, will be added to the business case of the Venture and can negatively impact performance. This will ensure that the most cost-effective operating choices will be selected and that the power, size and capabilities of the parent organisation will be leveraged as much as possible. The Venture is managed and monitored over the course of the business plan i.e. up to 3, 5 or 10 years. Profit and loss are calculated, performance reviewed against the targets and reimbursed according to the reward programme. Rewards can take the form of bonuses, virtual shares in the InnoVenture with agreed buy-back arrangements, real or virtual corporate innovation crypto-currencies etc. The main feature is that these rewards are based on real performance and that the award process is transparent and fair. the “buy-in” of non-team member cooperation. A company can run one or many InnoVentures at the same time and, in the extreme, could actually only run InnoVentures. Ideally, the InnoVenture culture becomes so ingrained into the corporate culture, that it becomes a de-facto way of working and delivering innovation. 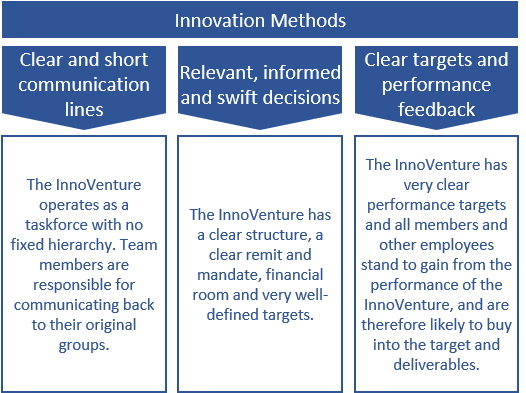 How does the InnoVenture perform against the Innovation Ambitions? The InnoVenture completely fulfills the innovation ambitions . It creates long-lasting profitable and innovative products, that built on and expand the company’s strength and strategy, delivered by a knowledgeable innovative employees. Through the function of the mission, the targets and the operating environment, the InnoVenture profits from the same innovative methods as a regular startup. The communication lines are short, within the InnoVenture and, through the team members, within the organisation, the decisions are made at the right place by the right people at the right time, and the clear objectives of the Venture steer and inform behaviour. The InnoVenture approach couples the drive and incentive of the start-up culture with the knowledge and skills of the corporate employee and leverages the corporate benefits of size, market and operational platforms. This “innervation” creates an almost unbeatable internal and external competitive environment that thrives on change, performance and agility, without sacrificing quality and efficiency. If you’d like to know more about this approach and how to implement it, please get in touch.